Well, the rehearsals for my latest solo project are well on the way and the ‘sales’ are looking quite optimistic to, to say the least. Jen Heyes (the Creator & Director) and Ailis Ni Riain (the Writer & composer) and I have been burning the midnight oil, tweaking and honing this most ambitious and exciting of projects. 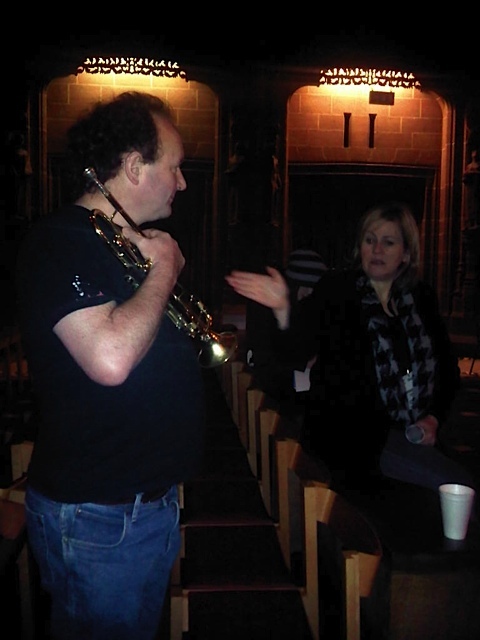 Brendan being put through his paces by the Director, Jen Heyes. 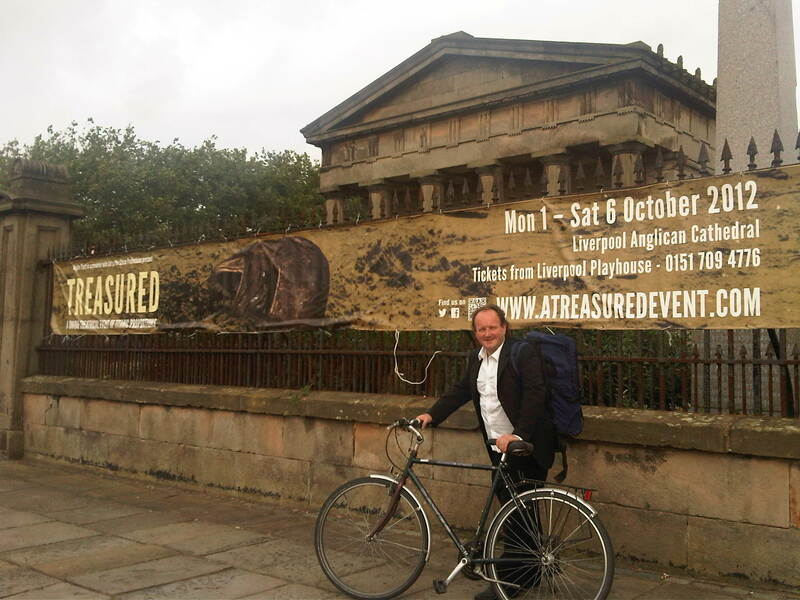 For those who haven’t been following this thread, Liverpool Anglican Cathedral is being completely transformed for this massive event based on the disastrous happenings before, during and after the tragic maiden voyage of the Titanic. 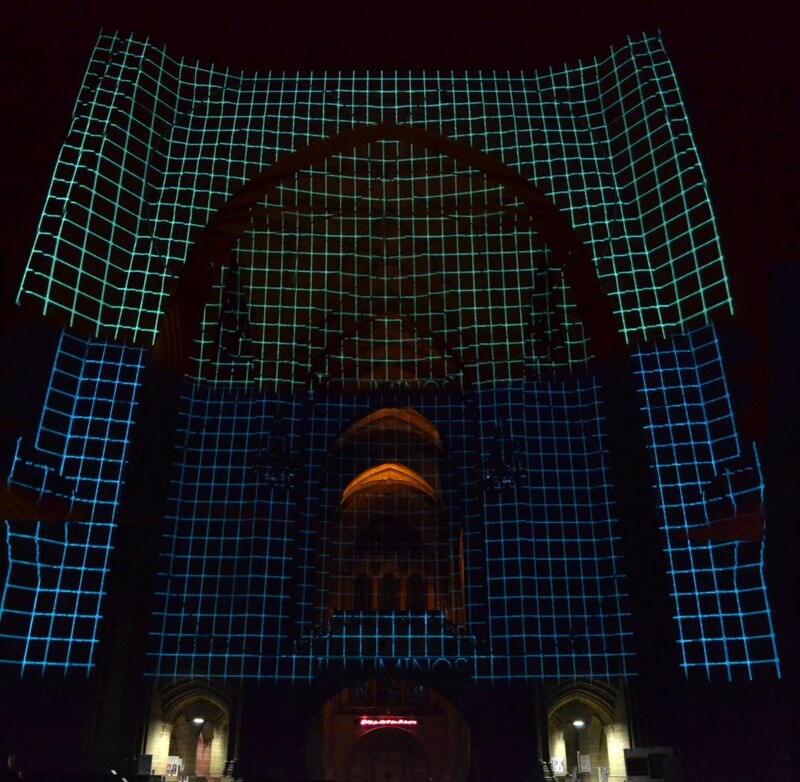 In there giant darkened performance space, the audiences will be treated to amazing life size projections of the Titanic and other massive structures by Luminix, awesome sea-soundscapes and stunning set designs by Olivia Du Monceau. 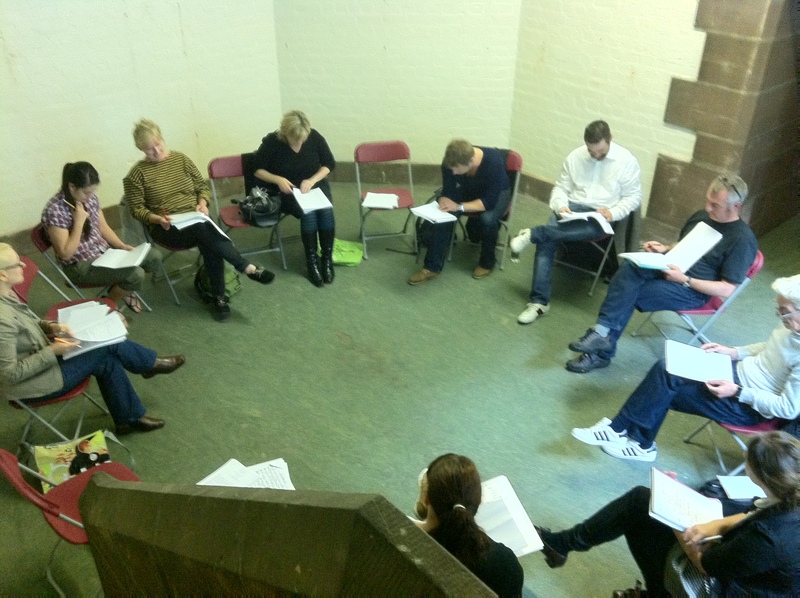 So far, rehearsals and various read throughs have been great. The stellar cast and the Aspire Ensemble (the excellent group playing roles to enhance and support the speaking cast) have been a pleasure to work with. This is a very different way of working to that of an orchestra musician. The creative input from all and professionalism has been fascinating for me. Of course, these virtues are essential in the RLPO also, but in such different ways. The score and script have both been created around the centre-piece of a lone solo trumpeter. All the music has been especially created to suit my playing, as a musical storyteller within the performance space. I will be taking my place amongst the actors; interjecting in their speech, introducing all the characters with individual themes, big solo items and adding the emotion and ambience during the ‘silent’ acting scenes. Before the main performance there will also be a series of installations for the audiences to stop and ponder for a while. I will also be participating in these, not only as the audience watches but also as they migrate between one installation and another. 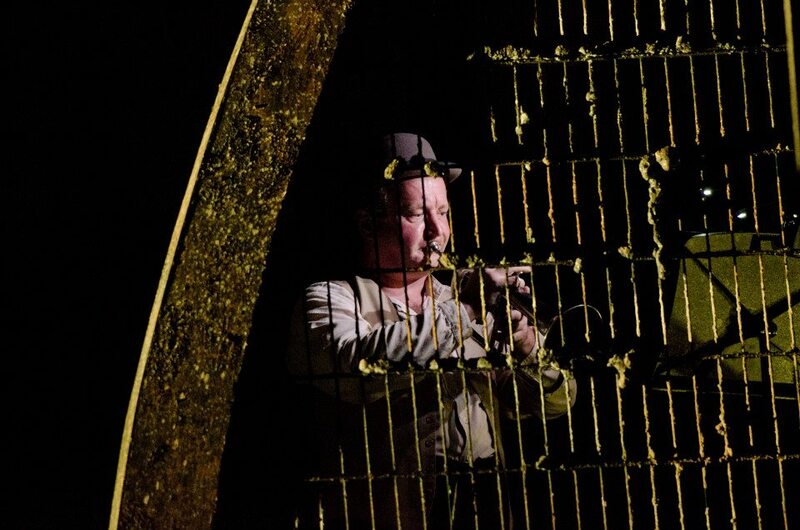 That’s me in my costume, playing in and around the ‘wreck’ of the Titanic. The remarkable musical score is a herculean task for a lone trumpter. There will be eight ninety minute shows between the first and sixth of October and Ailis has written me everything from rhythmic fortissimo passages in the stratosphere to low quiet solos testing a trumpeter’s control. 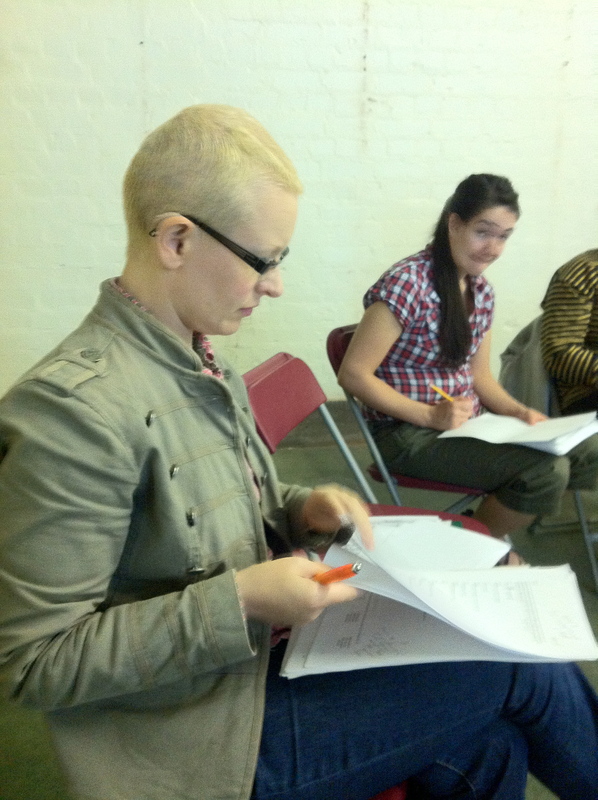 The stellar cast, reading through the script. Yesterday evening was my costume fitting before the rehearsal and tonight will be a rehearsal that I have been awaiting with great anticipation. I have a duet with a wired aerialist for some five minutes immediately after the Titanic Impact scene. 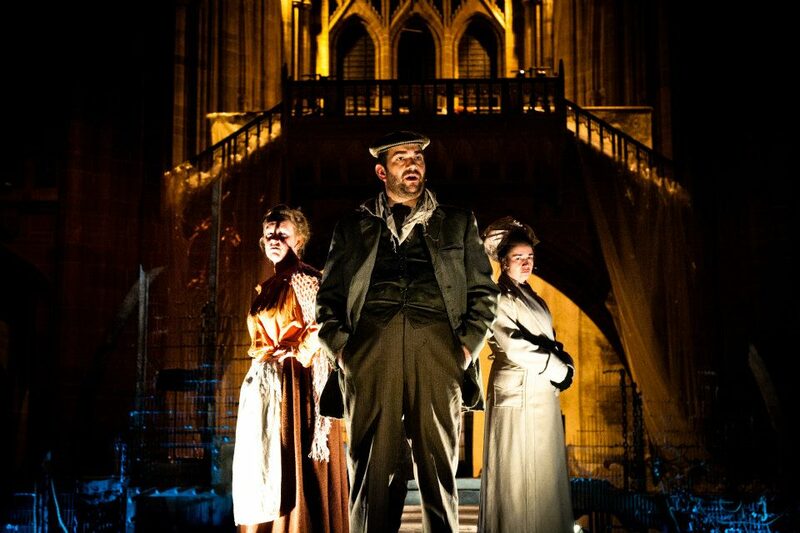 Wendy the aerialist will be portraying the drowning up in the air of the cathedral whilst I react to her every move… (I can’t say anymore). This evening Wendy will be choreographing her scene for me to perform to. 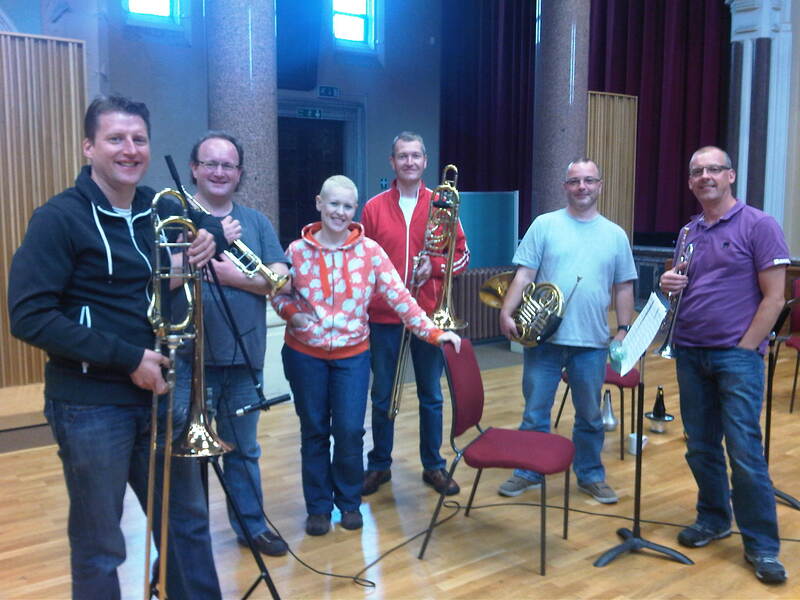 Ailis Ni Riain with the RLPO Brass Ensemble for the pre recorded brass music representing the souls of the dead. 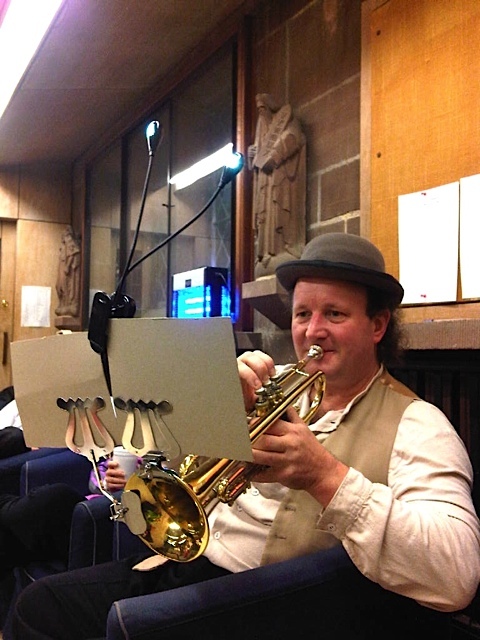 This entry was posted in About Brendan Ball, The Tour Blogs & Brendan's Solo Blogs, The Trumpet o-iii<O and tagged Contemporary music, music theatre, new music, new solo trumpet music, solo trumpet, Trumpet solo music. Bookmark the permalink.